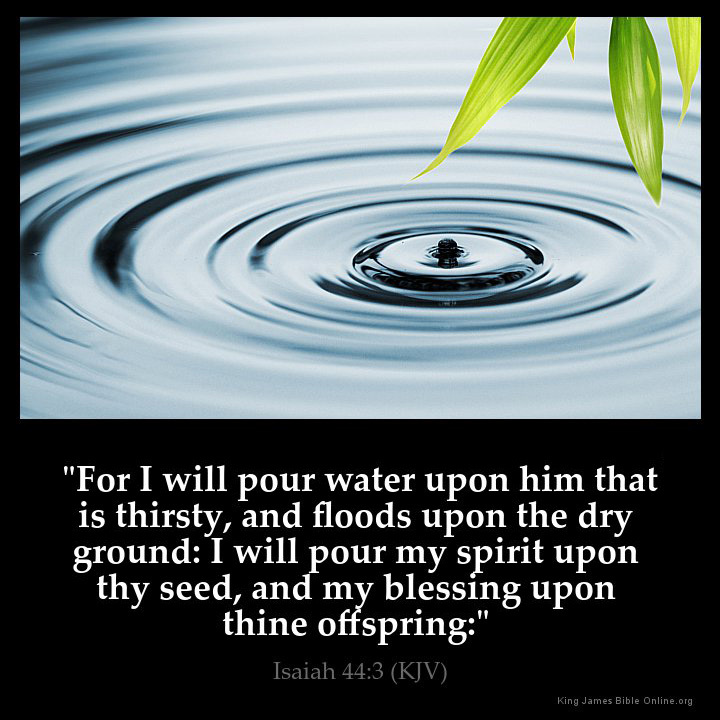 "For I will pour water upon him that is thirsty, and floods upon the dry ground: I will pour my spirit upon thy seed, and my blessing upon thine offspring:"
"Jesus Christ the same yesterday, and to day, and for ever. Hebrews 13:8"
"Amen, Bro/sister - Prayer I would value your urgent prayers for the power of God upon us with deliverance today. Matt 18:-19 England UK"
"His promise to Abraham and all of us that believe in him...God never breaks a promise...Amen!" "I receive that! In Jesus Name!" "HE will never let HIS children "down""
"Amen..thank God for your love.."
"Let ther b an out pourin of yr holy sprit oh Lord. I submit nd yield unto u holy sprit Amen." "Thank you Great Father for your many promises." "Thank you Lord for your Mercy and Grace.!!!!!" "The word of the lord is the only thing that will remain when evry will be diminishing. Thus can't be compared @ all." "This is a great verse, but it clearly states, at the beginning of the book, that this was given to Israel. How about some scriptures that were given for the Body of Christ today, during the current dispensation of grace?" "Am still waiting Lord in heaven above.."
"Ameeeeeen! God let me be among the partakers of this blessing." "Amen !!! God is good always..."
"Amen and amen..thank you my Lord.."
"Amen Father nd pls ve my guide"
"Amen Glory to God,thanks a lot for all the blessings u give us and will give por your blessings to my home my family and will be home soon <3"
"Amen! Amen!! Amen!!! N jesus name." "AMEN. Thank you Lord for your promises never fail." "As the deer pants 4 streams of water, so my soul pants 4 the streams of living water. Quench my thirst loving father in Jesus name." "Be it unto me according to your word." "By da faith i trust nd blv hlp doz huz head dznt in jesus nym.amen"
"Drench me with the living water Lord Jesus....."
"Father my land is dry Please Lord feed me with the hevenly water's." "Father, let it be onto me according to ur words Amen!" "Give me the grace Lord to stay in the source of that water"
"God showing you straight to your face how he will heal you and guide you to him, Amen. He will give to all those who believe on his name, the Lord Jesus Christ, Eternal Life. To see Gods face and to learn from him directly. God telling you all things and lifting that fear from your heart and conscious. Giving you a new heart, soul, flesh, and renewing your Spirit, praise God! Love thy neighbor as you Love [email protected] put the Lord Jesus Christ first!" "I am trusting on YAHWEH POUR THE BLESSINGS TO US ,TO MY DAUGHTERS AND GRANDKIDS MYKA AND MARSHALL"
"I can always use a good bible verse first thing in the morning and last thing before I close my eyes ! Thanks"
"I cntinuely need you O Lord !" "I look to the mountains;where will my help come from? My help will come from the Lord,who made heaven and earth." "I lord i thirst so much for your blessings"
"I need ur blessing right now amen"
"I receive in jesus name amen." "I thank god that he has poured his spirit out in me"
"I thank you God for all the opportunities and the wisdom you have given to us.. Amen"
"I want to drink from Christ well." "IT IS DONE IN JESUS EXCELLENT NAME, AMEN & AMEN.!!" "JESUS SAID I AM THE WAY, THE TRUTH, AND THE LIFE; NO ONE GOES TO THE FATHER EXCEPT BY ME"
"Let it rain on me"
"Let ur word find fullfillment"
"Lord Jesus Christ. i believe, help my unbelieve." "Lord pour dat water on me now"
"Love Isaiah and love KJV<>><"
"Oh Lord I thank you for all the wisdom that you have adorned those that seek it,I'm,very thankful,that you,are my FATHER!!!!!!!!!!" "Praise to you Lord for all of the things you have given to me even when I thought I siding need or want them." "Salamat lord sa lahat sa guidance mo sa araw-araw, amen"
"Started reading king james. which pam is this?" "Thank u God for yo promises to those who trust in yo word"
"Thank You Lord! I receive it!" "Thank you my wonderful Jesus for your Word"
"Thank you that we thirsty for you Farher thank for your blessings on my offsprings for they are your God u are merciful and so good to us Amen." "Water in the word, signifies knowledge of natural truth of love and faith." "Yes I believe in word of God"
"Yes! agreed!!! pour it Lord!!!" "You are beautiful my friend !!!" What Do You Think of Isaiah 44?